Both crabgrass (Digitaria sanguinalis) and quackgrass (Agropyron repens) are weed grasses that bedevil gardeners. They have vigorous, spreading roots and regenerate quickly from any piece of root left in the ground. It's important to know which one you have because different methods are needed to control them. Keeping an eye out for these weeds and removing them immediately is the best way to halt their invasion. Crabgrass is an annual grass that dies in late fall and grows new plants from seed the following year. It's low-growing, lighter green than turf grasses and sprawls on the ground in a pattern reminiscent of a crab. It roots form new plants where its stem joints touch the soil, and it also spreads by seed. The leaves of crabgrass are thin and hairy, growing from 3 to 6 inches long and less than 1/2-inch wide. Its seed heads are four strands of short stalks that rise from the tips of the stems. It appears in midsummer. Crabgrass lies flat, so its seed heads often aren't cut off when you mow the lawn. Seeds that fall to the ground from late summer through fall survive the winter to sprout in spring. Use a pre-emergent herbicide in late winter or early spring to thwart the seeds' germination process. The active ingredient, commonly trifluralin or dithiopyr, interrupts the seedling's growth. Pre-emergent herbicides are usually sold as dry granules that you apply evenly with a lawn spreader and then water in, applying 1/2-inch of water across the entire area. 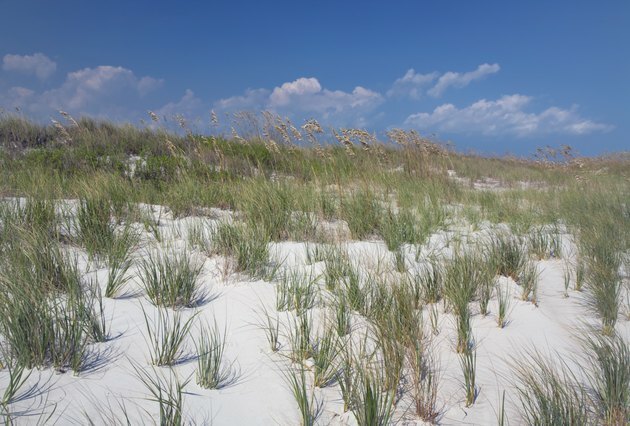 For example, one brand of crabgrass preventer recommends applying 1.75 to 3.5 pounds of granules per 1,000 square feet for cool-season grasses, and 2.25 to 3.5 pounds per 1,000 square feet for warm-season grasses. Formulations vary, so follow the manufacturer's instructions on the label. Pull young weeds by hand. 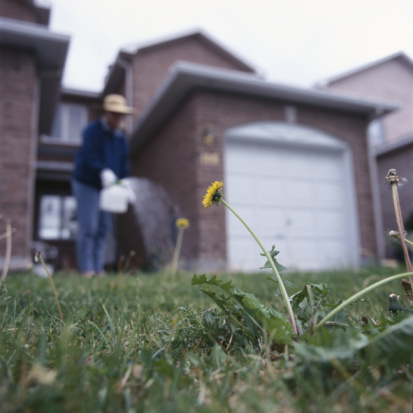 In the lawn, many herbicides aren't effective on established weeds because they kill turf grass along with weed grass. Prevention and vigilance are the best cure. Quackgrass, also known as witch grass or devil grass, is a cool-climate, perennial grass that thrives in U.S. Department of Agriculture plant hardiness zones 3a through 9b. It came to the United States in the mid-1700s and has spread throughout the northern U.S. and southern Canada. It appears in late spring and early summer and has long, thin stems that reach 1 to 3 feet tall. In contrast to crabgrass, it is an upright grower. The leaves are coarse, narrow and dark green. The single seed heads resemble the heads of grain crops. Quackgrass spreads by seed, by rooting at its joints where they touch the soil and by fleshy, underground, running rhizomes, which have sharp-tipped points. If the quackgrass is not in a lawn, you can apply a non-selective, systemic herbicide labeled for quackgrass, which will kill its top and roots. Glyphosate, for example, a common weed-killing chemical, works on quackgrass. Apply it the early morning on a calm day when the weeds are actively growing. Mix 3 tablespoons concentrate with 1 gallon of water and apply with a sprayer. If the quackgrass is in a lawn, you can dip a sponge in the solution and apply carefully only to the quackgrass. To prevent quackgrass in a lawn, treat the area in spring with a pre-emergent herbicide to eliminate seeds deposited the year before. Wear gloves, protective clothing and eyewear when mixing and applying all lawn chemicals.